I have to admit I didn't think I would. After all it's expensive, generally crowded and full of, well, Disney characters, many of whom I don't actually appreciate. The rides all skew to small children and to be able to truly experience the parks you need to get there before it opens, which means getting up at the crack of dawn. But wow, it was fun. My son had a blast and most of the rides are just amazing (except Peter Pan's Flight. Don't do that one), and almost everyone who works there really, really love their jobs and are about the nicest people on the planet. It definitely earns its rep as "The Happiest Place On Earth". See, one of the reasons I was nearly as excited to go there as my kid was the Marvel stuff. After all, Disney's produced a few Marvel movies (you may have heard of them). So I was all set to enjoy Marvel-themed rides and buy Marvel tee-shirts and blush at the Disney "Cast Members" (as they're called) in superhero outfits wandering around. 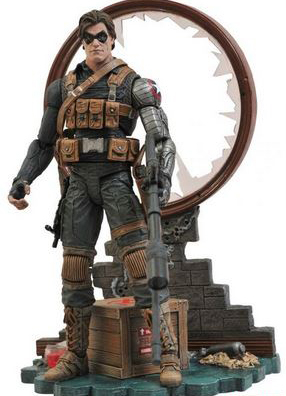 This particular figure is only available at The Disney Store. No problem, I figured. I'm going to the mother-lode of Disney Stores. I'll snap one up the first day. Nope, no action figures at the parks, except some really lame ones of Captain America. No tee-shirts except two styles for guys and also really lame. No one in costume. No rides. 1) The Disney Store is owned by a separate company to the stores at the parks. You can only find them in malls, and they carry different merchandise. Like Marvel Select action figures. 2) Universal Studios Orlando also have rights to Marvel characters, rights that they bought years before Disney thought it might be cool. Universal's Islands of Adventure has a Marvel section with rides featuring Storm, Spiderman, The Hulk and Doctor Doom. They have employees wandering around in X-Men costumes circa 1996. They have loads of Marvel action figures, including the Marvel Select that you can otherwise only find at the Disney Store. 3) There are Marvel things at Disney Land in California, but Universal very, very cleverly bought the exclusive rights to have Marvel stuff in their Florida theme parks. That's why Disney has to more-or-less pretend that their super successful films don't exist. As you can imagine, Disney is working to change this. As I'm imagining, Universal is probably asking for Walt Disney's soul in exchange. I can't wait to see how the deal goes down. And to get to the Disney Store and finally get my damn action figure.